Interior decorating, crafts, and gardening, all by me...Chance. I have been committed to cloth diapering right from the start. From my research before my baby was born, I found that using my own cloth diapers was a great way to both save money and stop sending massive amounts of diapers to the landfills at the same time. I'm a real tree hugger, so hours spent researching, buying and washing cloth diapers is a small price to pay for the payoff of helping the environment. Working in India, I once went out with my students to clean up a huge pile of trash near our village. As we cleaned, we came across many used disposable diapers. It really was a very disgusting job, one that I would not want anyone to have to repeat. As I thought about what diapers my baby would use, I realized I did not want to contribute to that sort of mess. Here in America, I will probably never have to clean up disposable diapers from the landfills, but I hate to think they are there, and subsequent generations will have to deal with them one day. Cloth diapering is not for the feint of heart. It is a lot of work. You have to be comfortable touching wet/dirty diapers, being around smelly diaper pails, and that sort of thing. As I tried to decide what kind of diaper to use for my baby, what I learned is that it is very hard to know what will work for your baby until that baby is born. There were also not a lot of reviews a year ago. I tried to get a bunch of different types of diapers in the beginning so that I could see what worked. But somehow this never happened. Although I registered for a bunch of different cloth diapers, no one gave me any, except for my mother-in-law who bought a couple gDiapers. I guess it is just not fun to give a new mom diapers. After talking to a coworker who did the whole cloth diaper regimen with her two children, I decided that the best two brands to focus on were gDiapers (they are the only ones sold at BabiesRUs) and Bum Genius. 1.) 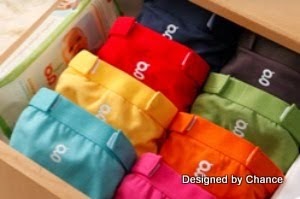 gDiapers are absolutely the cutest thing in the world. As you can see from the image above they are very colorful. 2.) They are also very trim making it a bit easier to fit my baby into normal size clothes. I found that because cloth diapers are more bulky, you have to dress your baby in larger sizes. 3.) I also liked that gDiapers have several layers to them. 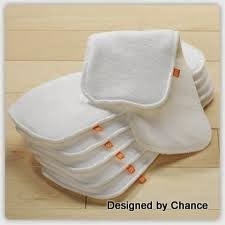 Which means I can change the inner cloth liner (pictured above) without changing the whole diaper. 4.) The covers, plastic bag inner liner, and cloth lines are all breathable. This helps reduce diaper rash. 5.) gDiapers are also a bit cheaper in the beginning. I bought 8 covers, 24 liners and one pack of extra bags totaling about $250. 1.) They don't fit my baby very well. My boy is quite chubby, so the covers are tight, and we got quite a few blowouts before I figured out how to put them on correctly. 2.) The diapers come in several sizes. This means that as my baby grew, we had to upgrade the whole system, thus making the fact that they are cheaper at first, not so helpful later. Once our baby made it to the Medium size (pretty quickly because he was so chubby), it gets a bit better, because the cloth liners and bags fit cover sizes M-XL. 3.) The diaper is not very absorbent. One big pee and my little guy is wet. I have to change him every two to three hours when he wears these. When he does #2 I have to change him right away (he makes this very clear to me). 4.) The covers fade fast. I dry them on a line in my house (in the shade), but they still faded quite quickly. 5.) In order to get the good price on covers, we went with a pack of six covers, but they only came in green and orange (their signature colors) so besides the red and blue ones we bought to round out the set of 8, our color options are pretty boring. If we buy more for the next size we plan to spend a bit more and get a rainbow of colors. 1.) One size fits all. The diapers are designed to grow with the baby. There are lots of snaps to change as the baby gets bigger. 2.) Very absorbent. My little one stays dry all night long in one diaper. With the wicking inner layer, he does not feel the wet when he goes. 3.) The diaper does not leak. Because the covers are waterproof, and large enough to fit my boy well he does not get wet even when he wears the same diaper for a long time. 4.) They also come in lots of cute colors. We have a black one with math on it that my husband loves. 1.) Every time I have to change him I have to use a whole new diaper. Meaning the cover and the insert. 2.) The covers require air drying, and take a while to dry. 3.) The liners stain. But they are inside the diaper, so only I see them. 4.) It is not breathable. The covers are totally water proof. This causes more diaper rash. 5.) Each diaper is quite expensive. Each diaper comes with one liner and one newborn insert, but is $19-24 a piece. My baby went through 12 diapers a day the first four months (and really, sometimes still does), so I needed 15-24 diapers total. 20 diapers at $20 each is $400. That's a lot to shell out all at once. This is a one time investment, but was too much for us right after our baby was born (we also needed a new couch). 6.) Snaps. Changing my baby's diaper in the middle of the night, half asleep and in the dark, is hard with all those snaps. 7.) They are quite bulky, much more bulky than the gDiapers. If I could go back in time I might buy all Bum Genius, but I might not. In the long run, it is the best option financially. However, now that we have used gDiapers I also see the value in this system. My baby has very sensitive skin, so I worry that a non-breathable diaper would cause him worse diaper rash than he already gets. gDiapers are better when we go out as well because they are smaller, and more easy to pack in a diaper bag to wash later. 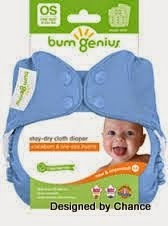 I use gDiapers during the day, and Bum Genius overnight. This works for us. I didn't mention the savings over disposable. If I had to buy diapers for my boy I would have to buy 10 packs of diapers a month at $15 each. So that's $150 a month. My son is almost six months old so I would have spent $900. Now, I might be able to get them cheaper, and I might be able to stretch out changing him, but it is still a significant savings. Not to mention, I'm still using the current gDiapers we bought four months ago, and won't have to get the next size up for a while still. Also, I'm saving the cloth for my second child, meaning the savings doubles because I won't have to invest in diapers at all by then. Really it makes a lot of sense. Do you cloth diaper? Some people think I'm crazy, and others admire my commitment to cloth diapering. what is your opinion? Ok we are almost done (if you want to do the whole project see these two previous posts first: post 1, post 2). I can't wait to get to some other projects (they are almost done, so finishing this series might give me the push I need to get some other stuff completed). Now that you have the curtains taped, paining them is super easy. I mixed fabric medium (found at craft stores) with my own paint. I used some indoor paint left over from my dining room. I really love the color. Just followed the directions, I think it was a 1:3 ratio for paint to paint medium. In my experience, a little paint medium goes a long way. Don't worry to much about the amount of paint medium. Even if the curtains come out a bit stiff, it is not a problem. I then just rolled the paint right onto the curtains being careful not to paint in the areas I had marked with green tape. Here is one more shot of one painted curtain and one not. I then took the tape off before the paint had dried, which makes it less likely the paint will chip. Let the curtains dry. To hang my new curtains I decided to use rings and clips. I found some simply ones at Lowes (they were also a good price). By hanging the curtains with clips, I could clip the blackout fabric right to the back of the painted curtains. This provided my nursery with a nice dark space for my little one to sleep. It also kept the regular fabric and the blackout fabric from being permanently attached. Blackout fabric needs to be dry cleaned, whereas my cotton chevron fabric does not. I measured the fabric from the floor up and folded over the top to the desired length. I then tucked the blackout fabric inside the fold. Next, I measured across the width of the fabrics and clipped the fabric together with my clips. I was not very exact about all this. As long as it was roughly the right width I was happy. When clipping the fabric just be sure you get all three layers of fabric in the clip. Finally I hung the clips on the rings (which were already threaded to the pole) and hung the curtains. Done! This was truly a project of love, but oh so worth it. Please feel free to pin this to Pinterest. 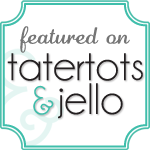 I'm having technical difficulties adding a pin widget, but will figure it out eventually. This post continues from the last. If you want to know how to mark your design see the last post. I have drawn out the process on graph paper to make it easier to understand. Essentially this is what you will do with your curtain. What you want to do when taping is to remember that you will be painting between the tape on every other zig-zag. In the photo of the actual curtains above, you can see that the yellow chevron stripes are painted only every other gap between the tape. I used the green frog tape to mark the stripes I was not going to paint. I started at with the bottom row. I made each marks as described in the last post. I taped between these marks. Starting in the left bottom corner, I stretched my tape to the first point six inches up and over from the corner on a diagonal. Make sure that the bottom of your tape (the part that will later be a strong yellow edge) hits both the valley and the peek. In the drawing above you can see that the blue tape (a blue line) has the bottom edge of the "tape" touching the edge you want to be yellow later. Be careful that the corners of your pattern are nice and clear. In order to get the chevron stripes the same width I had to remember that only one edge of my tape would mark the edges of the yellow stripe. You will only be painting over, one side of the tape to get the nice yellow stripe. If you look at the diagram above, or bellow. you can see that the tape goes on the inside of the stripes that will not be painted (the white stripes). I kept them straight by adding big green "x's" to remember not to paint there. The tape has to be lined up so the bottom edge of the blue tape is along the top of the first and second rows of marks. Then the top of the blue tape has to along the third and fourth rows. This creates the negative space (where you paint the yellow) the same width as the positive space (white). Another way to think of it is that only one edge of the blue tape is actually the edge of the chevron pattern, where you will be painting. You will only be painting over one side of the blue tape, so only that side has to be perfect. I know this sounds very confusing. But just remember that you are, in essence, just taping from one point to the next on the grid of dots you created in the last post. Be sure to keep the bottom (or top) edge of your tape on each mark. This helps keep the lines straight and the valleys and peeks clear. Continue to tape your design until the whole curtain is done. I taped two of my curtains off at the same time so that I could line up the chevron pattern across the two curtain panels. It took me about 3-4 hours to mark and tape each curtain. 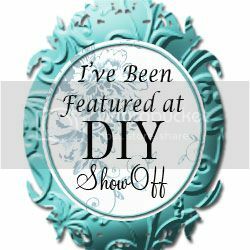 I was very pregnant at the time, so bathroom breaks, squatting, bending and crawling around on the floor took longer than usual (man I was so sore after each curtain). Yay! Once you have these babies taped, you are good to go. The painting is so easy!! Come back next week for what should be a very quick tutorial on how to paint and hang these lovelies. 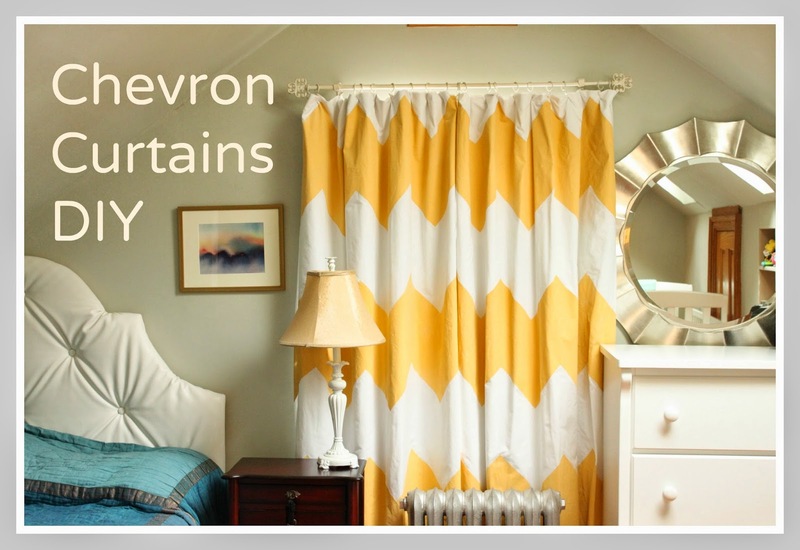 When I was designing the nursery I really wanted large yellow chevron curtains. I looked high and low for the pattern I wanted, but could only find very thin (at most 2 inches) chevron designs. I also was not crazy about the colors (the yellows I found were too green). So I made my own. What I thought would be challenging, turned into a marathon project that took a couple of months to finish. It did not help that I was six, seven, and eight months pregnant at the time. Or that I tried to do this in the middle of a heat wave. But now they are done, and I do love them. I also attached blackout fabric to keep the room nice and dark for my baby. More on that later. This post has many steps so I'm breaking it into several posts. Start with regular white fabric. Cut the curtains to the length desired, making allowances for hemming the edges. Hem all the way around. I like to make the top and bottom of my curtains with slightly wider hems, for weight. Don't worry about attaching them to the rod, I used rings with clips. This also makes it much easier to hang the blackout fabric. Cut the blackout fabric to match the size of your hemmed curtains. Set aside. You won't need the blackout fabric until the curtains are done and ready to hang. I decided not to sew the blackout fabric to the curtains because the blackout fabric requires dry cleaning. By keeping them separate, and only using the rings to hang them together, it will be super easy for me to take the curtains down and wash the regular fabric (which gets much dirtier). If the blackout fabric gets dirty I can just wipe it down. Lay out your cotton curtain fabric on the floor and tape all four edges with painter's tape. Or if you have the space, you could attaching them to the wall with painter's tape. Just be sure you have a wall you don't mind getting paint on. This would alleviate a lot of the crawling on the floor I had to endure (it was not easy while so very pregnant, I assure you). I did a quick experiment and have concluded I prefer the blue painter's tape to the frog tape. That's me. This is where things get tricky. My first try was a total failure. This is how your curtains should look after taping. I wanted my chevron design to be one foot from peek to peek. I took a fabric pencil and marked every six inches across the bottom, top and sides. This creates the "grid" you need to mark out the design. I decided not to draw a lot of lines because they would be hard to erase later. The grid on the curtain is made with rulers and measuring tapes. The image above, is a drawing of what you should do with your curtain. I never got any photos of this part (don't know what happened) so I recreated the process on graph paper. The best way to understand this process is to make two rows of marks at a time. That way you will be able to see the chevron design as you go. The first row is already done. It is the row with six inch marks along the bottom of your curtain. I started at the bottom because I figured I could not change it. The top can be adjusted as I decide where to make my loops. For the second row, I took my measuring tape and stretched it from the six inch mark on the left side (just above the first six inch row on the bottom) to the corresponding mark on the right side of the curtain. I them used my fabric pencil to mark every foot (12 inches) beginning six inches in on the left. These marks will become the first yellow peeks. They are the top of the dotted lines on the diagram above. I was also careful that my horizontal marks matched the vertical marks I had created in the beginning. Each mark you make in the center becomes either a peek or a valley on the chevron design, so you want them to match up both vertically and horizontally. 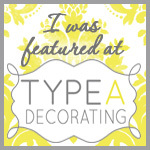 I then created the chevron design by taping the curtain. Starting from the left corner on the first row, I stretched the tape up to the first mark on the second row. Then stretch your tape back down from the second row to the mark one foot in on the first row. Continue across the curtain. Remember that each peek and valley will be one foot apart. I will explain how the tape is applied so that each yellow or white row is actually the same width in the next post. For the third row of marks, I put my measuring tape on the next (six inches up) left and right marks from the last. These marks are for the valleys, so the marks have to correspond with the marks of the first row. To do this I marked every foot from the left. The fourth row is an exact copy of the second row (see a pattern?). Start six inches in, and make marks for every foot. This creates the chevron pattern. Then tape (see next post soon). I then continued this pattern. With one foot offset marks for each peek and valley every six inches all the way up the curtain. In the end, you will have a white curtain with horizontal rows of dots one foot apart (if you don't tape as you go that is). Each horizontal row is six inches above the last. Remember that each row is either a peek or a valley. This will help to keep your one foot marks offset from each other. Since this tutorial is quite complicated I leaving the rest for next week. Be sure to check back for the taping process, because if you don't tape it right, you will get very frustrated, very fast. Also, let me know if you are still confused. I will try my best to clean up any confusion in this process. I promise it is all worth it in the end! Slippery slippers are the worst. I have always just lived with them, but now that I have a baby to think about, I don't want to fall. I really don't want to fall on my wood stairs with a glass door and stone landing at the bottom. Not good. So a slippery slipper solution was much needed. I love these slippers. They are warm, and oh so comfy. As you can see, they are also quite slippery. I decided to go with the basic black, and just a hint of red (for some flair). Pick any colors you want. I could totally see someone doing this for dancing shoes at a wedding (something blue?). 2. Decide on a design, and lay any ground work. I decided to do dots. They seemed like the best way to get a good grip. I also wanted a little "fun" thrown in, so I added a heart. I put the heart right over the ball of my big toe. I made the heart first. Then added the dots. 3. Apply your pattern all over the sole of your slipper. I used the already delineated shape of my foot as shown from normal wear. It was pretty easy to see where my foot touched the ground. If these are new slippers you could lightly outline your foot with a pencil. or guess. It is the bottom of your foot. The instructions said to dry the paint for 7 hours. After 7 hours I put them right on. Ahh warm toes again! That's it! No more slippery slippers. I have been wearing these for a couple of days and they are fine. I lost one dot to my wood floor, and the peeks have worn down a bit. Overall, not bad. And.... I like the hearts! I grew up a vegetarian. I remember the first time my father fed us chicken. He snuck us out to "town" and brought us some chicken soup. When my mother heard that we had been "tainted" with meat she chased my father down the street. Or, at least, that is the story my father used to tell us about our first meat experience. As an adult, I have developed a taste for meat, and will usually eat it if offered at a friend's house. I eat most types of meat, but have never been able to stomach straight beef. Beef is just not appetizing to me. However, in general, I prefer most of my meals to be vegetarian. My husband and I really like seitan (pronounced SAY-tan, not to be confused with the devil: satan). It is a kind of chewy, meaty, wheat based protein that cooks well, holds it shape, and tastes really good. We have breaded and baked it, fried it, and, my current favorite, put it in a vegetable stew. Now I have to warn you, seitan is made from wheat, and not just any wheat but wheat gluten, so if you jumped on the gluten free bandwagon then this is not a meat alternative for you. I am not a gluten free fan myself. I like bread, I like gluten, and I like seitan. I think that bread consumption should be limited for my waistline, but I don't have Celiac disease and I don't plan to go gluten free any time soon. If you are gluten free this recipe is not for you. The only problem with seitan is that it is expensive. My husband and I can buy a pint container of seitan for $7 in the health-food store. That is one meal for two people. That's fine to pay once in a while, but we can't do that every week. So we decided to make our own. It is actually really easy, and SO MUCH cheaper. My husband (the mathematician) figures it is about one-eighth the price when made at home, and the more you make it the lower the price gets. The hardest part is getting the ingredients. Without further ado, here is the recipe I use. I have adapted the recipe from 1,000 Vegan Recipes by Robin Robertson (a great book by the way even if you are not vegan). *a note on ingredients: Vital wheat gluten is the protein from wheat. I buy it at my local health food store. I usually have to buy sever small packages of it to get enough to make the seitan. Nutritional yeast can also be found at a health food store. It is quite salty. I have seen it used in many vegan recipies, but my favorite way to eat it is on popcorn. In a food processor mix vital wheat gluten and rest of ingredients through paprika. Blend with a couple of pulses. Mix oil, tamari, and water, then add to dry ingredients while processor is running. Process for a full minute until dough is formed. It should look like the image bellow. Turn onto a lightly floured cutting board and knead until smooth and elastic, about 2 minutes. This part was fun, I like kneading dough. My dough was a bit wet, so I sprinkled a bit of flour on top. Combine all Simmering Liquid ingredients in large sauce pan. I use a 2 1/2 quart pot and it is a bit tight, but still fine. 3: Cut the seitan dough into four pieces. Add dough to pot of simmering liquid. Bring to a boil and then lower heat and simmer for one hour turning occasionally. (I had a screaming baby at this point so it boiled a bit more than it should and it only got stirred twice, it was still fine). Turn off heat and allow to cool in liquid. I just left it right on the stove. Once it was cool and I had a minute to myself I put the seitan in containers. Each quarter of the dough fits in a small plastic pint container (I reuse ones from our local Chinese restaurant). Store the seitan in its simmering liquid. We use one pint per meal, so I save one for the week, and freeze the rest. Then I have seitan for one month. Sometimes one piece will be bigger than the rest, that is pretty normal. I also like to save any remaining simmering liquid for any soups or stocks I might need. There is a lot of flavor in it. There you have it, four pints of seitan for a fraction of the price you might pay in stores. This recipe is also quite easy to double, and I will have to do that next time because I promised to bring some homemade seitan to a friend. I think the homemade version is so much better. In stores it comes cut up, and I never like how they do it, and the taste is not quite as good either. With our version we can cut up the seitan as we like, depending on the recipe. 4. Use in your favorite recipe. Many chicken and tofu recipes can be made with seitan instead (you just might have to play with the flavors. Seitan does not have a strong flavor on it's own) Try: [Baked!] Chicken Fried Tofu over at Peas and Crayons (I love her) but use seitan instead. So good (but not vegan: be warned). I made a vegetarian stew from one of my favorite Mooswood cookbooks, and added cubes of our seitan. It was delicious, easy, and a one pot meal. Maybe I will give you guys that recipe (I adapt it) another time. Seitan is a great protein alternative. Sure you can eat beans and rice for protein, but why when you can eat something so much better? I always thought seitan was only something "rich" vegetarians could eat, but now I see that it is quite attainable for anyone. Go, make seitan, and embrace a new kind of vegetarian protein, or meat, alternative. And once you have tried it, come back and let me know what you think. I have not written a blog post in a couple of months (not including the one I just wrote on cranberries). Any guesses why? If you said because I had a baby, you are right (and you have been following my sporadic posts pretty well). My beautiful baby boy was born November 24th, 2013. He was a whopping 9 lbs, 21 inches! The name Paul came from my father who passed away in 2010. Arjun is a nod to my India background. Arjun (or Arjuna, with an "A") is a Hindu warrior from their sacred texts. I had the birth at home. This was a very personal decision, and it was not made lightly. My hubby was a little skeptical at first, but once he understood how professional my midwife took everything he knew this was the best way for us. I'm not going to talk about the benefits of home-birth (there is enough info on the web about that) but I will say that I'm very glad I did it this way. My birth went very well, it was quick and exactly how I wanted it. My midwife, doula, and everyone at the birth were so great. I love them all! Thank you!!!! Baby Paul is now three months old. So here is a quick montage of his growth and changes. Paul at birth. He is about ten minutes old in the shot above. This one was about a week after his birth. Again about a week later, he had some baby acne. I got those stickers at Babies R Us. I like to keep track. Paul at two months old. You can see he has gotten some more expression in his face and body. I also started taking a photo with him lying down on the bed. I love the gold background. Finally, Paul just last week (three months old). The shot above just made me laugh. So I added it. I have others of him in the chair that are a little more "cute" not so funny. He was not in such a playful mood this time. What an amazing gift it is to have a baby. This little boy is so cute, so sweet and he just warms my heart with every smile and snuggle. I absolutely love him with every fiber of my being. They say you won't understand until you have one and "they" are right. 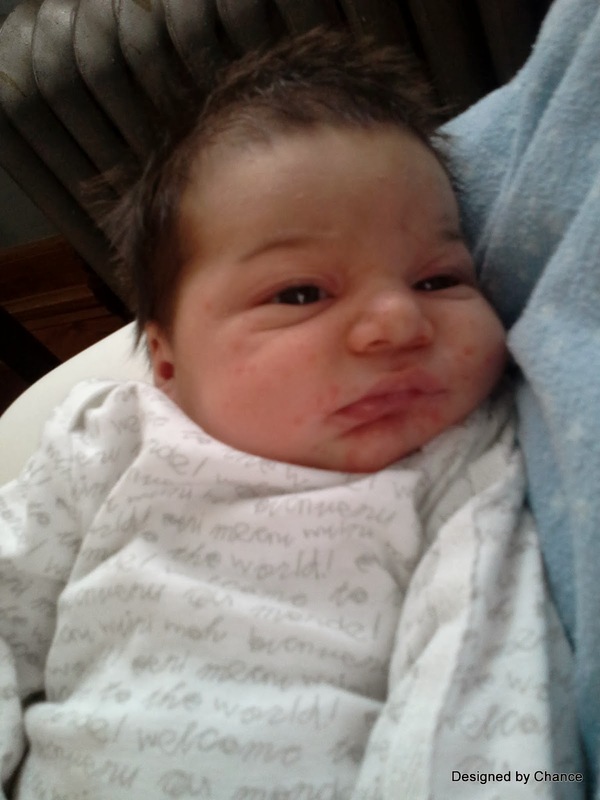 My life is now all about diapers, spit up, sleep habits of babies and trying to stay sane in it all. The cold, snowy winter has not made it any easier. But, I have made some new "mom" friends as I call them. They are all nice ladies. I'm working on his nursery (he still sleeps in our room right now), a book of all the cards he got over his gestation, and I made the cutest family tree. All of these projects will eventually become blog posts. Lets see how it goes. I would really like to get at least one blog post a week going regularly again. Wish me luck.